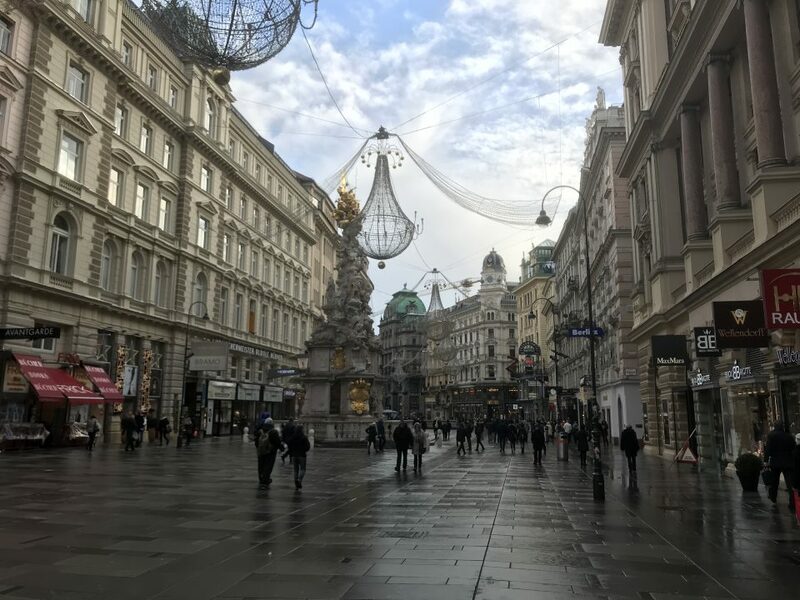 It was a great day in Vienna for us as we saw quite a few attractions that the city had to offer. As well as several more Christmas markets. After an enjoyable first few hours in Vienna yesterday, we had a bit of a lie-in before leaving the hotel for some breakfast. We got the U-Bahn to Stephansplatz. 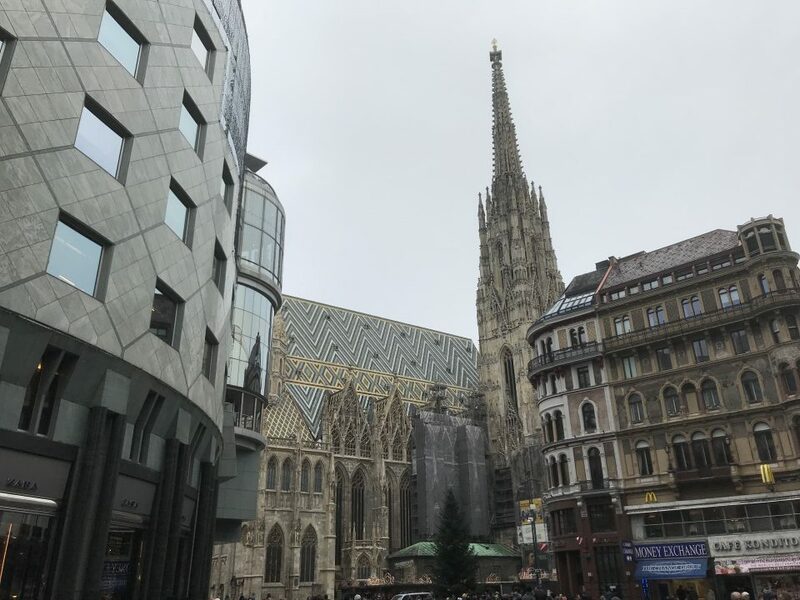 This is considered the centre of Vienna and is dominated by the imposing Stephansdom. The roof of Stepahnsdom is incredible to look at. The zig-zag rows of tiles make it distinctive from other city cathedrals we have seen. Inside Stephansdom we had the opportunity to listen to a huge choir who were no doubt rehearsing for their Christmas concert. Bravo! We then made the short walk over to Graben. This is one of Vienna’s most famous streets. There are quite a variety of cafes, shops and bars along here. 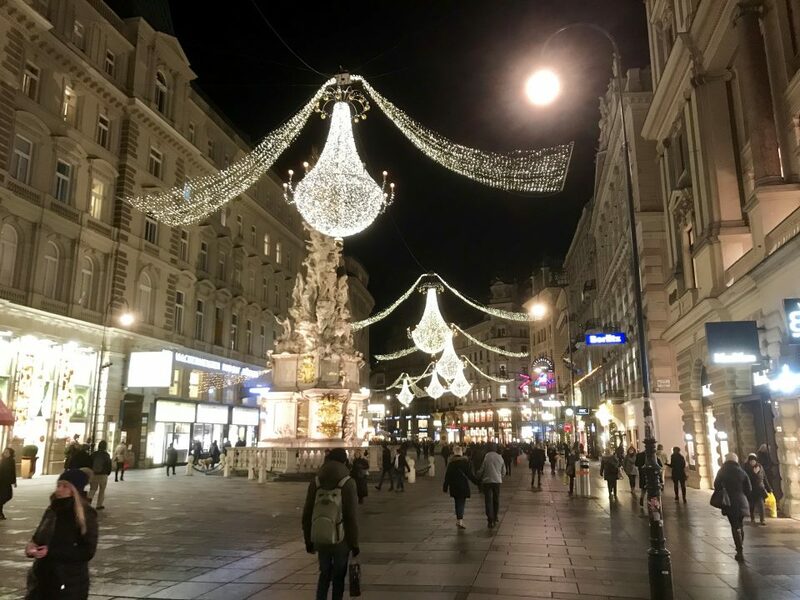 The Christmas lights on Graben look like they will be incredible when lit up. We were hoping that this would also be the case later. With a combination of light snow and a cold wind, we decided to warm up at a stall selling Amaretto and cherry punch. Even though it was a nice tipple it failed to warm us up at all. Continuing along Graben we arrived at the Pestsäule monument. This statue commemorates those who lost their lives due to the outbreak of the Black Death. Once we got to the end of Graben we entered Julius Meinl am Graben. This exclusive shop was selling all sorts of delicious looking food, but at big prices! 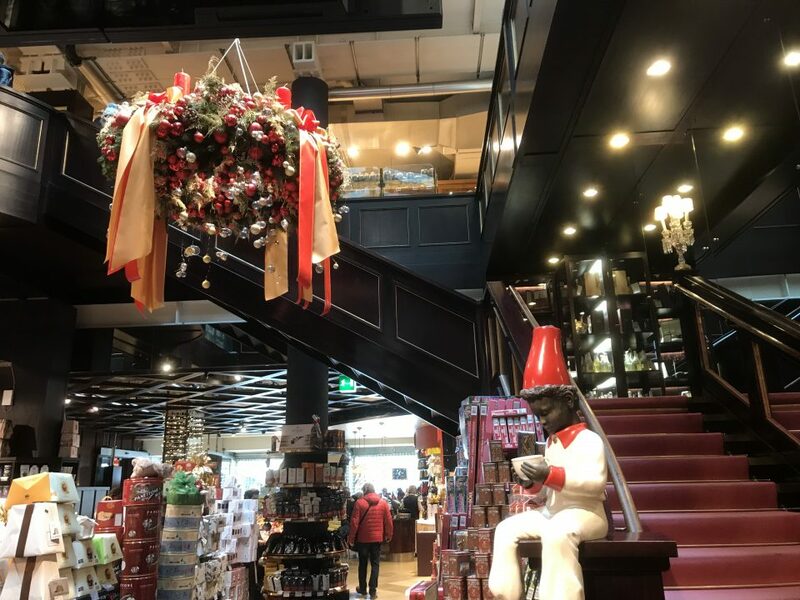 We resisted the temptation to buy some of these expensive items including French caviar and a chocolate Krampus. Altwiener Christkindlmarkt was our first Christmas market stop of the day. 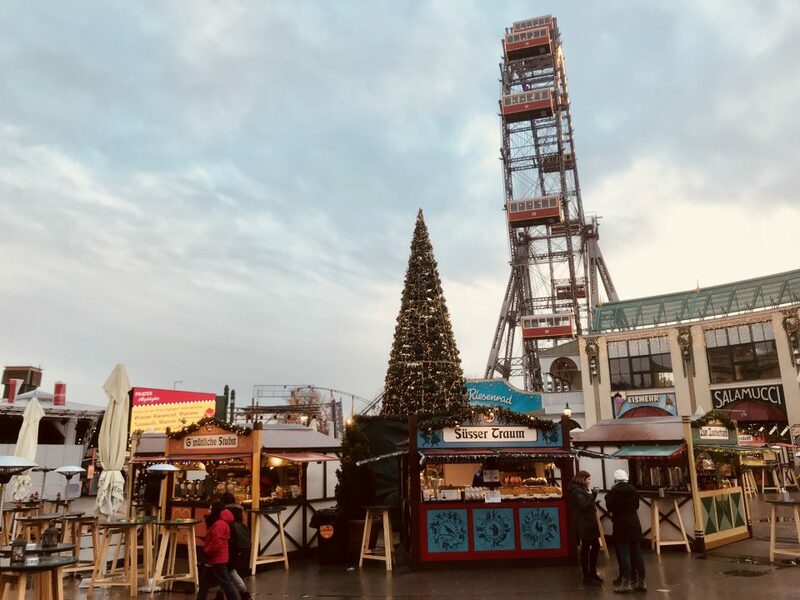 This is a small Christmas market with an array of crafts, decorations, clothing and food. I just had to try one of the chocolate covered marzipan sticks. It was devine but left me too full to have a Baumkuchen. Maybe later this week? 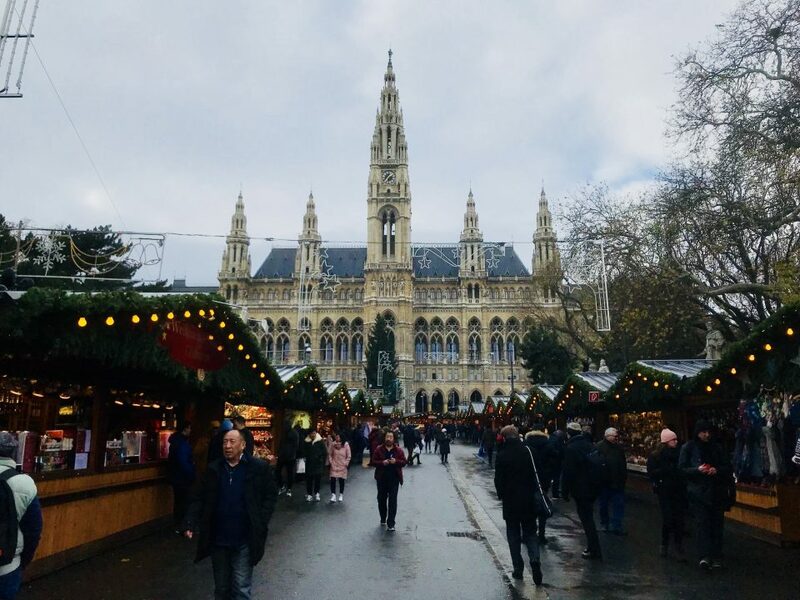 Vienna’s main Christmas market at Rathausplatz was nearby. Simply put this market is huge and has a wide variety of stalls selling more food, decorations and crafts. We had a walk around the stalls before consuming some raclette cheese with bread and onions. Very nice, but not as good as one I had in St. Gallen a few years ago. Then it was time for the wife to part with €16.50 to go ice skating. I was surprised that with all the time she spent on the ice that we didn’t end up in Vienna hospital! Rathaus is just behind the Christmas market and is Vienna’s new-gothic city hall. It was built in 1883 and the main spire stands at 102 metres high. With the sleet getting heavier we decided to start heading in the direction of our hotel. On the way we made a quick visit to the Winter Market at Prater. This market seemed more focused on food, drink and entertainment rather than the crafts at the other markets. This is probably because it features a live entertainment programme and is catering for the crowds that flock here. The Wiener Riesenrad was the backdrop for this circular market. This big wheel is nearly 65 metres high. It was then back to the hotel for a few hours before heading out for an evening in Vienna. After a few hours rest at the hotel we headed back into central Vienna. 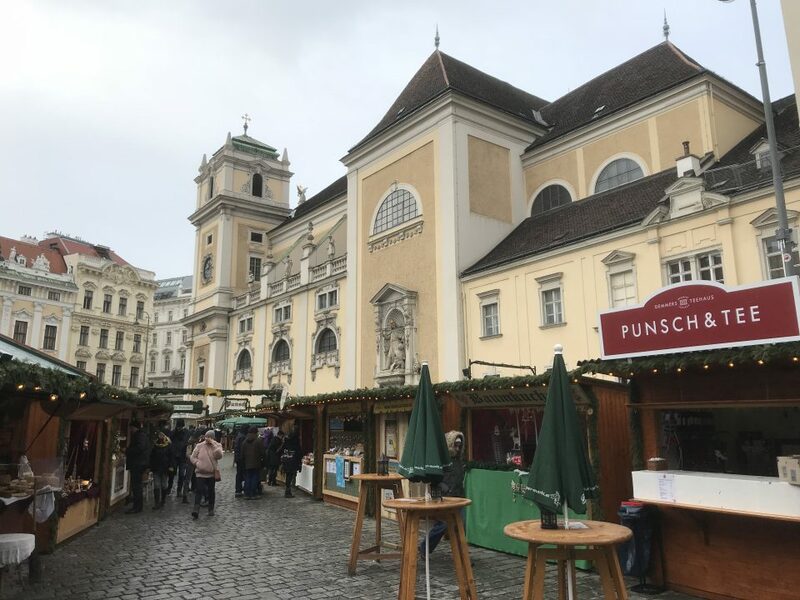 We had a quick look around the Christmas market at Stephansplatz before going back towards Graben. As we predicted earlier the Christmas lights on Graben were amazing. They were hanging over the road as giant illuminated chandeliers. Spectacular! For our evening meal we decided on Brezl Gwölb restaurant. 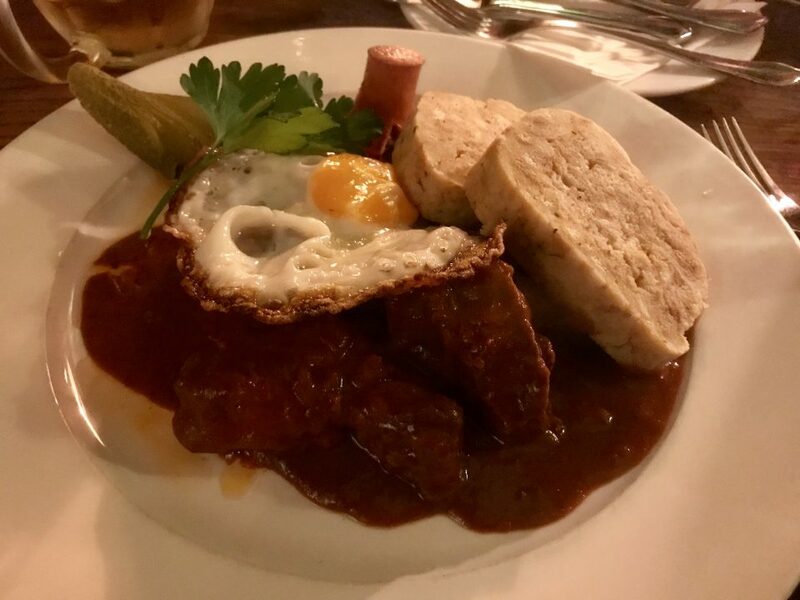 I ordered a Vienna goulash with braised beef, dumplings, sausage and egg. All is I can say is what a meal! Delicious is an understatement. After food we decided to go back to the hotel. But the parents and the in-laws started having a highly amusing five minutes by seemingly running off in random directions. The wife and I eventually rounded them up to get them back to the hotel.